WooHoo, the time has finally come! Registration for the Coastal Magic Convention 2019 is now open. As readers, we’re always looking for amazing stories and storytellers. I think one of the best (and most fun) ways to find new authors to add to our “to be read” piles is at a book event. It’s also a fantastic way to spend time with authors we already know and love. Registration for this small(ish), casual shindig is always limited to 300. So if you want to escape a “white winter” for some “beachy blues” next February, you need to register sooner than later! Mardi Gras weekend just happens to start during our shindig next year, so expect jazzy purple, green, and gold to be a recurring theme! Some of the things attendees can look forward to are a Mardi Gras themed Welcome Mingle on Thursday night, multiple themed meet & greets with small groups of authors, Cinema Craptastique (live-tweeting an awesomely awful movie) with live commentary by emcee Damon Suede, “Lunch with an Author” on Saturday, lots of fun panel discussions, a few author-hosted panel activities, and more. If you’ve been with us before, you know how this all works, and we’d love to see you again. ❤ If you’re new to Coastal Magic, HI THERE!!! I think you would have an awesome time. Since I may be a bit biased, I don’t expect you to just take my word for it, though. CLICK HERE to see some things previous authors and readers have said about their time with us. Then… head over to CMC’s registration page to claim your spot for the weekend. See you all by the beach!! 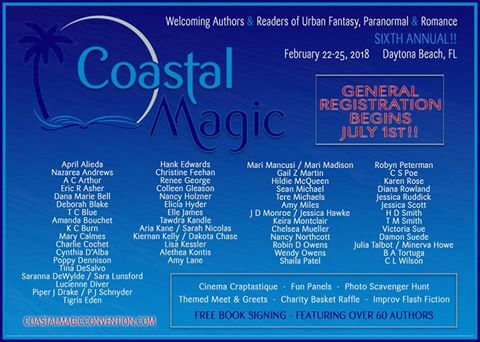 PS: You’re all welcome to come join us in the Coastal Magic Convention Authors & Attendees Facebook group! We’ll be talking about event-related stuff, random book stuff, and the authors will pop in from time to time to chat, as well! If you’re on the fence about registering, this may be a great place to get an idea of what you can expect during our weekend.